The fixture seems guaranteed to give the new-look Monarchs squad a tough work-out, with Aussie Josh Pickering hungry to show his mettle against former Monarchs skipper Sam Masters, who leads the Midlands visitors. Pickering is keen to see further improvement to his racing career in 2019, having raised his average by over a point last season. 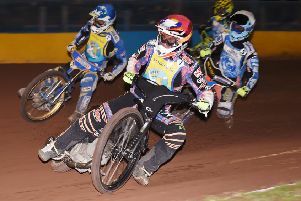 But Pickering, back for a third spell for Monarchs, insisted he has no plans to alter his daring round-the-boards style of riding this season, which induced heart failure among some home fans last term as he skirted with the fence in pursuit of points which produced a host of thrilling on-the-line finishes against some top opponents. Pickering has his sights set on a heat-leader role within the squad this season and finding consistency is going to be central to his hopes. Said Pickering: “It’s something I’ll be aiming for definitely, and there is no reason why I can’t. I’ll be riding at No.3 and that’s a position I like. Pickering added: “I made some mistakes last year but your aim is to work hard and seek improvement all the time. Pickering thinks Monarchs have a strong looking squad for 2019 and certainly believes the team will be targeting major silverware over the course of the campaign, saying: “Having another two Aussies in the team (Cameron Heeps and Justin Sedgmen) is pretty cool. Cameron is a good rider and Justin is capable as well. Ricky Wells: Born Auckland, New Zealand. Age 27. Cameron Heeps: Born Perth, Australia. Age 23. Josh Pickering: Born Heddon Greta, Australia. Age 22. Joel Andersson: Born Hardemo, Sweden. Age 23. William Lawson: Born Perth, Scotland. Age 32. Luke Ruddick: Born Melrose, Scotland. Age 21.